We look forward to welcoming pupils, parents, friends and families to our Open Day each year. The Open Day gives the St. Mary’s school community the opportunity to showcase many areas of activity, inside the classroom, in extra-curricular activities and in the wider community. School is open to visitors between 11am and 2pm, and this gives a chance for the local community – both friends of the school and people new to St Mary’s – to have an insight into the life of the school. A variety of refreshments will be available. The day includes Information Sessions for prospective Year 7 students and their parents. These sessions will take place at 11:30am and 1:00pm in our Main Hall (Room M1). 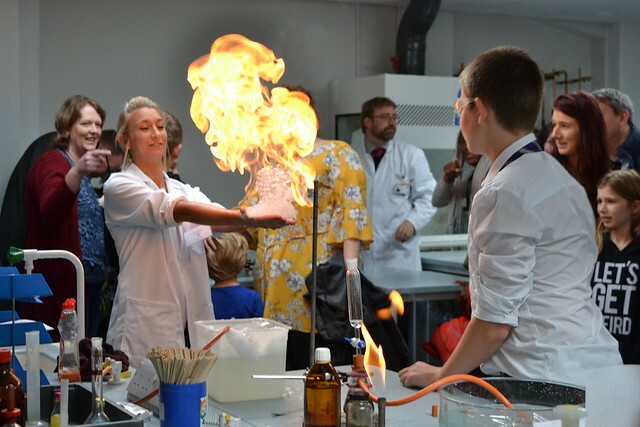 Our School Open Day demonstrates a seven-year journey, for the majority of our students, progressing into our Sixth Form and then to higher education. For others, it is a vocational route, including apprenticeships, again achieving significant success. Additional information for Key Stage 5 will be provided at our Key Stage 5 Information Evening (for those entering Sixth Form in September 2019) on Tuesday 20 November, 2018, 6:30pm–8.00pm. Our last Open Day in 2017 was very busy, and visitors enjoyed a wide range of fun activities. They commented particularly on the very warm welcome offered by all staff and pupils and the friendly and positive atmosphere. Our Annual School Open Day is Saturday 30 September 2017, 11am–2pm. Open to All. Our Annual School Open Day is Saturday 1 October 2016, 11am–2pm. Open to All. Our Annual School Open Day is Saturday 3 October 2015, 11am–2pm. Open to All.